First, grab some evergreen boughs. These can be branches of cedar, pine, hemlock, yew, or long stems of boxwood — whatever you like, or whatever you have in your garden. And if you don’t have access to evergreens, just visit your local florist. 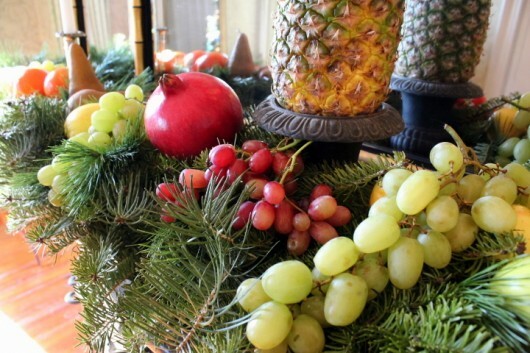 He or she will have all kinds of fresh greenery on hand throughout December. 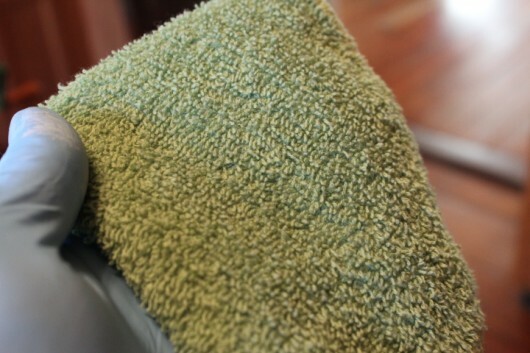 In any event, be sure to candy-coat the works with “Wilt-Pruf.” Wilt-Pruf , an anti-transpirant, will insure the boughs stay fresh and green for weeks. 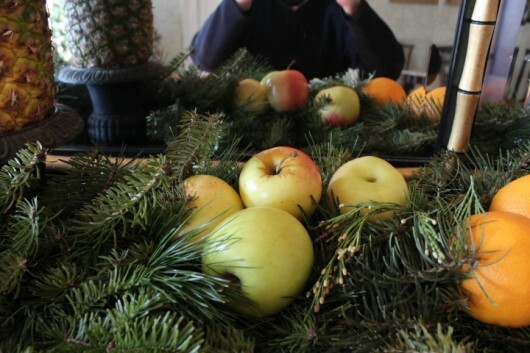 Next, arrange a focal point of some kind. A pineapple is a good idea. 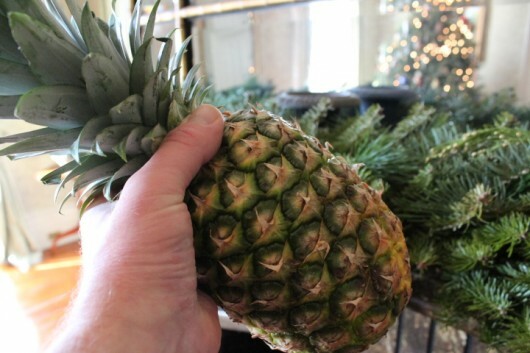 To give the pineapple extra height, I place it atop a small urn. 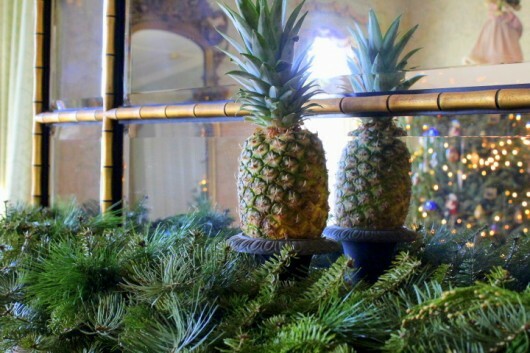 Set the pineapple atop an upside-down bowl. 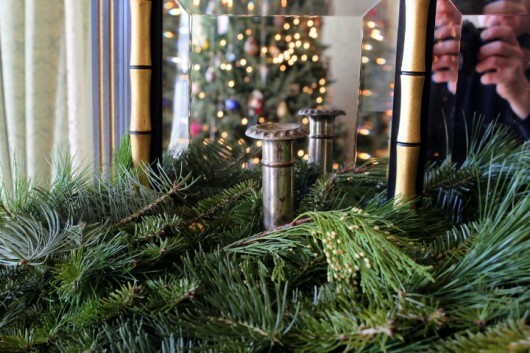 Place matching candlesticks at each end of the mantel. 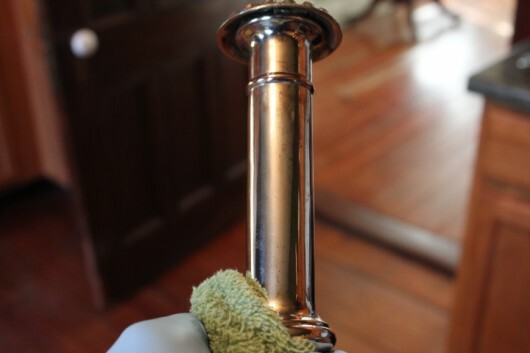 If you use silver candlesticks, and they are horribly tarnished, like mine, you’ll want to polish them first. 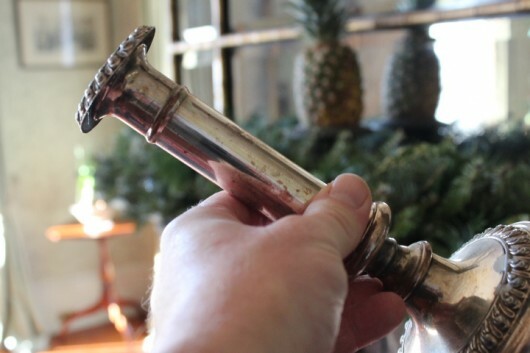 Tarnished candlesticks are not welcome in a Victorian setting, even when they are flanking a pineapple. And a bottle of pink silver cleaner. 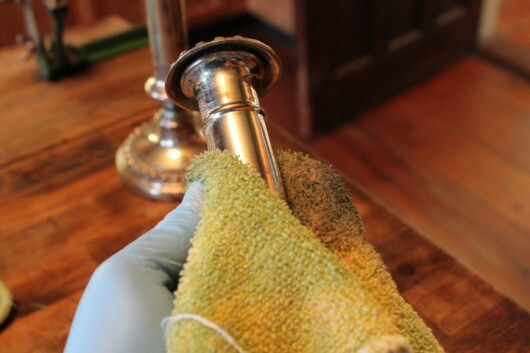 Squirt some silver polish on one rag, and then give the candlesticks a good rub-down. Buff to a shine with the other rag. Return the polished candlesticks to the mantel, and top each one with a tall, tapered candle. We now have a nice, balanced arrangement. But there’s more fun to come! Take some oranges, and place them near the candlestick on the right. 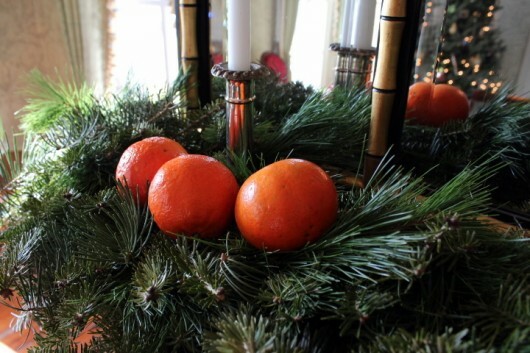 Arrange more oranges around the candlestick on the left. Now head to fridge, and grab some ‘Golden Delicious’ apples. Arrange them somewhere near the oranges. If you have a Bosc pear, position it between the apples and the oranges. A pine cone would make a good substitute for a Bosc pear. We’re merely trying to add a touch of brown to the mantel-picture. 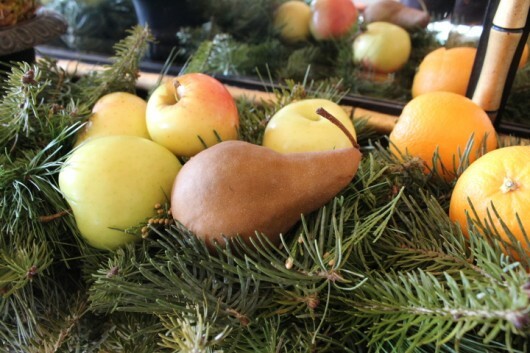 I arranged one pear at one side of the mantel, and a pair of pears at the other end. While the other pomegranate chose to sit beside a candlestick. And also near each candlestick. 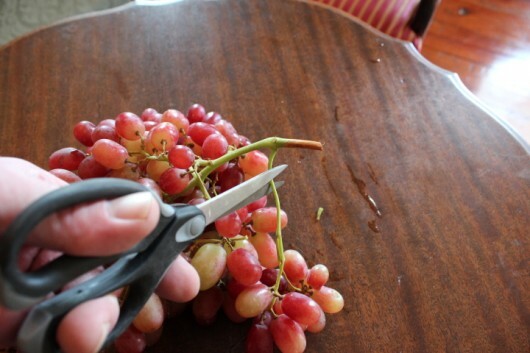 You can always cut the bunch into smaller bunches. 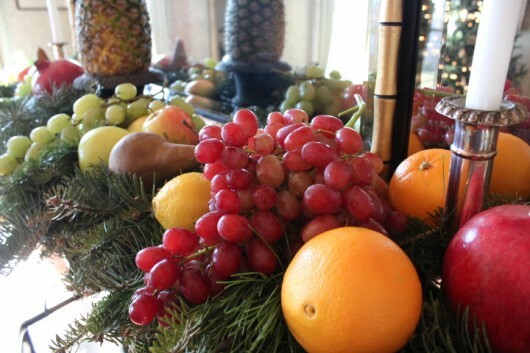 Arrange the red grapes here and there along the mantel. They look well among oranges, apples, and pears. 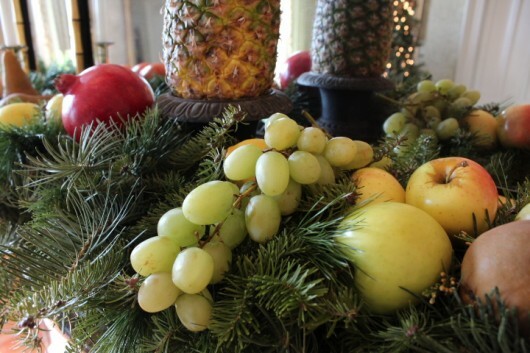 They also look dashing between a pomegranate and a cluster of green grapes. Frankly, grapes steal the show. Think of Margo Channing as a pineapple, and Eve Harrington as a cluster of grapes. That last sentence will make no sense to you unless you’ve seen this Bette Davis film. 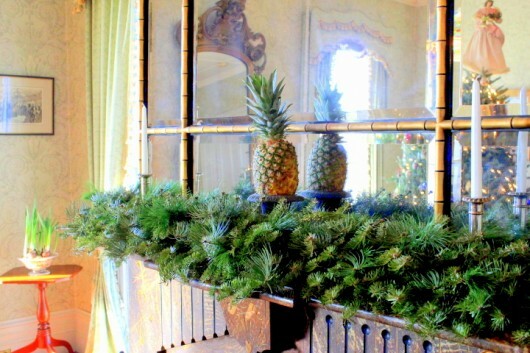 Well, that’s one way to achieve a merry mantel. Oh — I should probably mention that in a cool room (maximum temperature in my house is 65°F), the fruit can last for weeks. 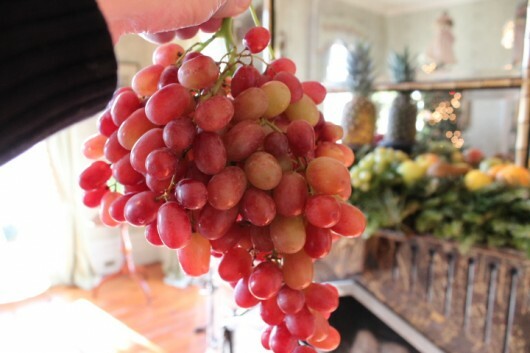 If a cluster of grapes or an apple should “turn,” I simply remove them, and replace with them with fresh. And when the show is over, I toss all of the fruit onto my compost pile. There they decompose, and turn into the rich soil that feeds my garden. In the comments field below, let me know how your own holiday decorations are coming along. Or, just say “howdy.” As always, I love hearing from you. 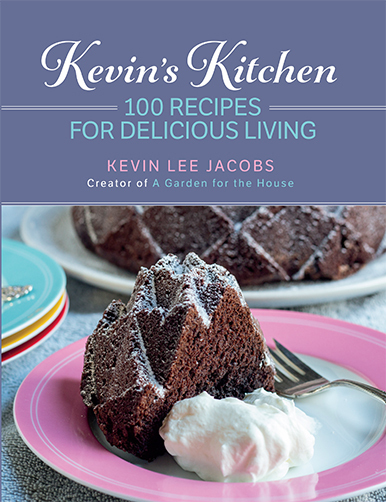 Don’t miss anything at A Garden for the House...sign up for Kevin’s weekly updates. We went to a living history museum because I love to go there and because they were celebrating an.old fashioned Christmas. 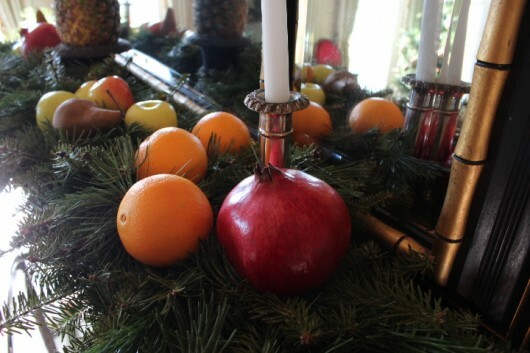 The theme was mostly about how cajuns celebrated Christmas during the 1800’s which was very cool but in one of the homes they went with a Victorian theme and used pomanders on their mantel. I had not realized that cloves could be used in making pomanders. Kathleen – Why, thank you! Myrtle Miller – Pomanders are gorgeous when pierced and then studded with cloves or star anise. If I had the patience of a saint, I’d make ’em! Clove-studded oranges! I remember making those when I was a kid, thinking my fingers would never recover from those pointy clove tops. Painful, but oh! They smelled so good. I could imagine all the kids (the fun group) in my family grazing their way past the mantle if I did that. Beautiful! Wishing you and yours a very happy and safe holiday! 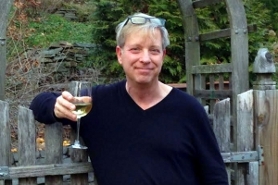 Hi Kevin – your mantle is gorgeous! 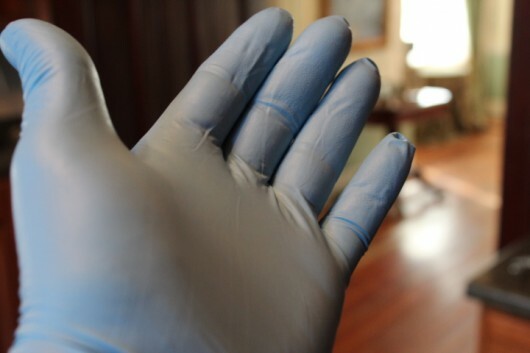 Where do you purchase Wilt-Pruf? I really loved your mantle display. It was warm and elegant befitting a Victorian style house. 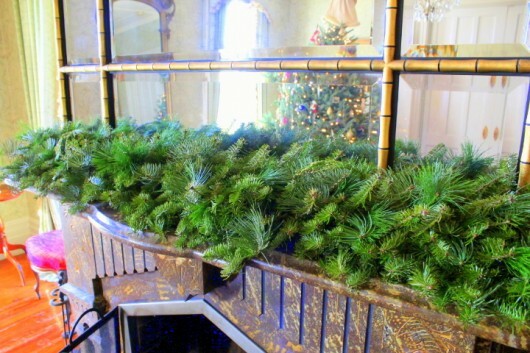 Biltmore has so many splendid ideas for decorating at Christmas – worth a visit at the holiday period. This year our mantle was decorated from recycled greenery, holly, Sweet Annie and the most lovely ornaments made from sunflower and pumpkin seeds for the annual Christmas Day parade in Greeneville, TN. This float was entered by the Big Spring Master Gardener Association. It was all natural with pine cones, branches of other shrubs and natural bird nests. Now , I once again will recycle the greenery to my compost and especially around my rose bed to add a little acid during the winter months. The boughs also protect the roses from heavy snow and damage. Any twigs left over in spring will wind up in the grinder to become mulch and so it goes. So the greenery taken from my property for the float has returned to bring beauty to our home during the holiday and continue to replenish our soil. I just love it. We have about 19 acres to landscape – what a lovely challenge. Hi Kevin… Love the mantel decor. 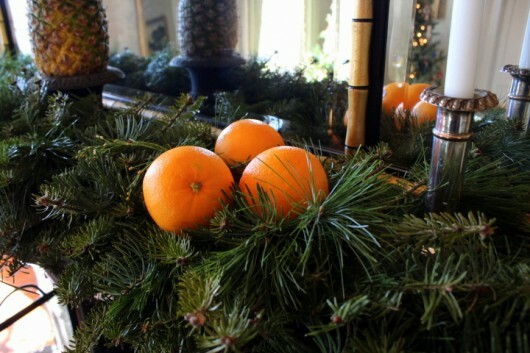 I always do a bowl of clove studded oranges nestled in amongst evergreens. However, this year I used lemons just to shake things up a bit. Just out of curiosity, I know you are big on Christmas decor indoors, but you do anything outside? 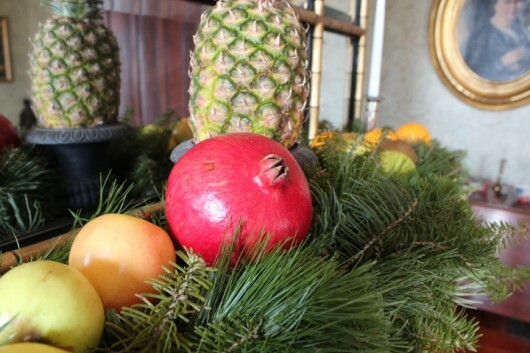 Urns of evergreens with winterberry and a velvet bow… Evergreen roping on your porch… A wreath on the front door? Your house just lends itself so nicely to Holiday decoration. Love the mantel idea. I don’t have one but it sure is pretty. 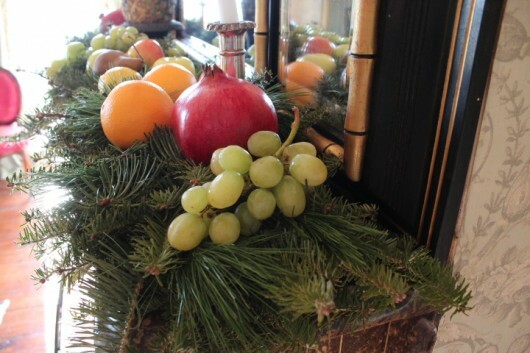 Beautiful mantel arrangement! 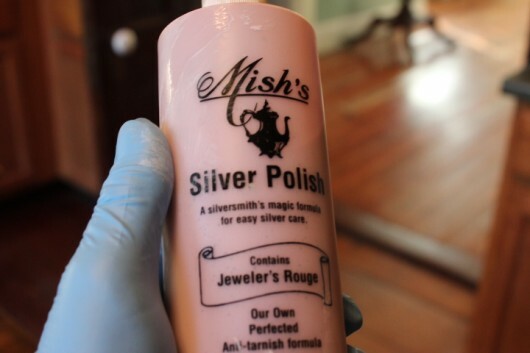 Growing up in my maternal grandma’s home (3 fireplaces), we used to do a different treatment on each one. My paternal grandma lived on a farm in Virginia and sent us all manner of greenery from holly branches to magnolia leaves with their wonderful brown pods and bright red seeds. So much fun to get creative and make different arrangements every year. 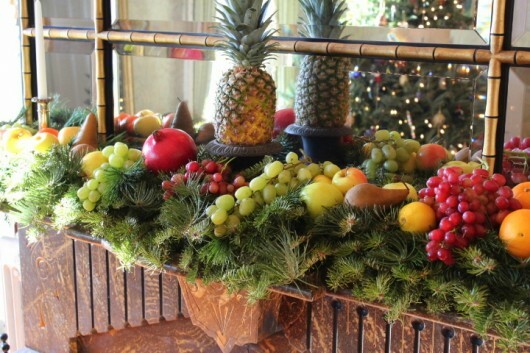 Love your use of fresh fruit. 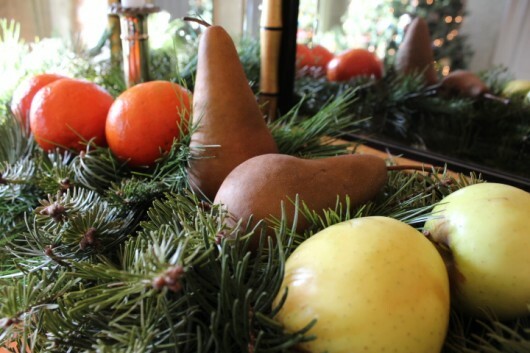 No mantel here, but the top of a hutch and an antique Dutch kass to decorate yearly. Thanks for the wonderful ideas! Hi, you can purchase Wilt-Pruf ,anti-transpirant, from Amazon.com. All About Eve is one of my fav movies!